The black asphalt became more rugged with every hairpin turn until it was no more. Compacted gray gravel loose in places supplanted it. The gray was devoid of any tint. It looked as if an algorithm had been used to neutralize all of the hues. 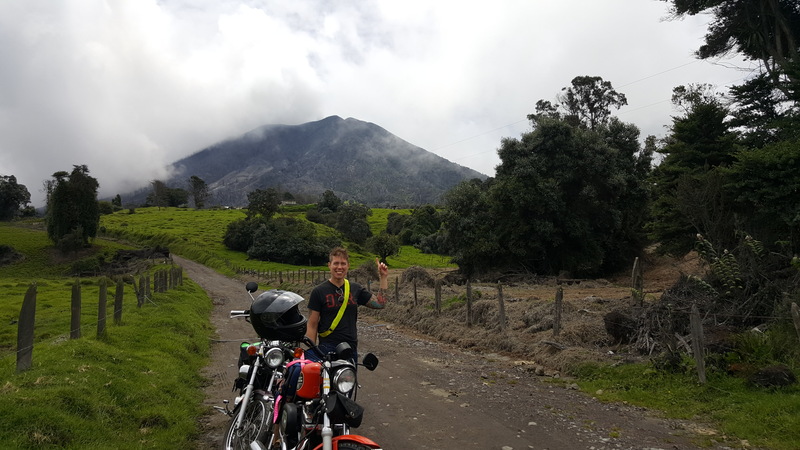 My motorcycle, a Suzuki 250 V-Star, wasn’t the ideal vehicle for off road mountain climbs, but the bike’s light weight made it easier to deftly weave my way up the volcano. A larger bike would have been a burden to balance at slow speeds and a struggle to reign in to the required slow pace. Although I missed the familiarity of my 750 Shadow, I was relieved that I wasn’t riding it. 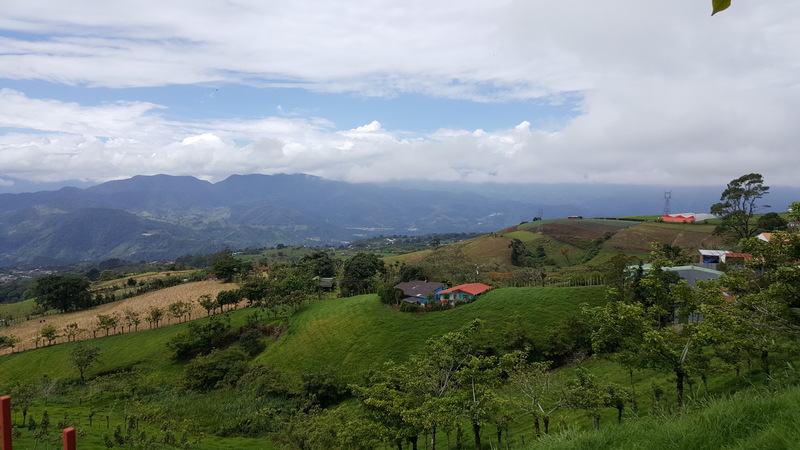 Towns had given way to rural farms, and passing vehicles disappears as we approached Turrialba. The volcano was belching sulfuric air and ash the day prior, so we took remote roads toward the summit to see how close we could get. The volcano, although fierce and scorching, left behind top soil rich with minerals; the grasses, trees, and crops were impossibly verdant against the desaturated gray ash on the road. Dirty roads around the top of Turrialba. We road past fields artfully hand-planted on inclines in defiance of the impossible topography impervious to all mechanical aids. Because of the peculiar environment the area is known for a specialty cheese, named in honor of the volcano. The producers of this cheese were lumbering, gentle giants. We saw many of them, some so well behaved as to be roaming free. There was a small shrine to Mary here that was perfectly maintained. The herd of cows we shared the rode with for a few moments were docile but curious of the rumble of our motorcycles. Their tawny brown fur laid close to their skin taught over the powerful muscles propelling their massive bodies forward. Each cow passed instinctively to one side or the other methodically clearing a path for us. Their brown eyes level with our own regarded us with slight curiosity. Later we shared the road with a family of horses. Mom and dad stood just off the path nibbling some grasses, while their foals rested, legs folded under, in the tall roadside shrubs. Like some of the cows, they were free to roam to the grasses that pleased them most. Their coats were glossy and groomed, two of them chestnut and the others sleek obsidian. The chestnut beauties had their noses dabbed with a splash of white, reminding me of one of the horses I rode as a child. It struck me as I rode away from the horses, that this is the bucolic fiction we are sold in the US. This is were our meat and dairy comes from. Except of course it isn’t. For most of us, our meat and dairy comes from factory farms where the animals never experience the outdoors let along feast on the grasses they are meant to. The animals were healthy, well groomed, and well fed, and I felt joy to know that this exists somewhere. We climbed until we reached a sign. The sign marked the way toward the acme of the belching beast. The air was heavy with sulfur and mixtures of low-lying clouds and smoke blew at intervals around us obscuring the beast and the path forward. The ascent to the peak was encircled by scorched earth. Echos of trees and underbrush stood as ghostly reminders of the power of the volcano. In a perfect line the verdant green abruptly transitioned to blackened charred tree trunks and smoking ash. The line between life and death was drawn with tree by tree precision. This one to the ash this one pugnacious life. It was just shy of this line that the sign told us to go no further. We took this sage advice and pulled off to the side to watch. The grasses and leaves freshly washed of ash by the rain contrasted so completely with the stark gray of the ash still clinging to the dead under brush. 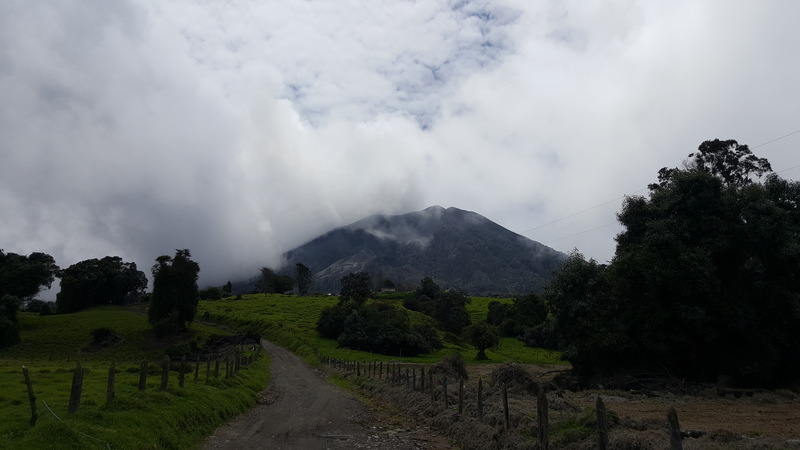 We were hoping for Turrialba to give us a show. Adriana wisely had us on the side of the mountain that doesn’t get falling debris. This allowed us to be reasonably sure we weren’t in real danger should Turrialba erupt. That’s Turrialba behind me. We were hoping to see it erupt as it had several times the day before and after we were there. The path leading away from Turrialba. She was quiet for us, so we headed to Irazu. 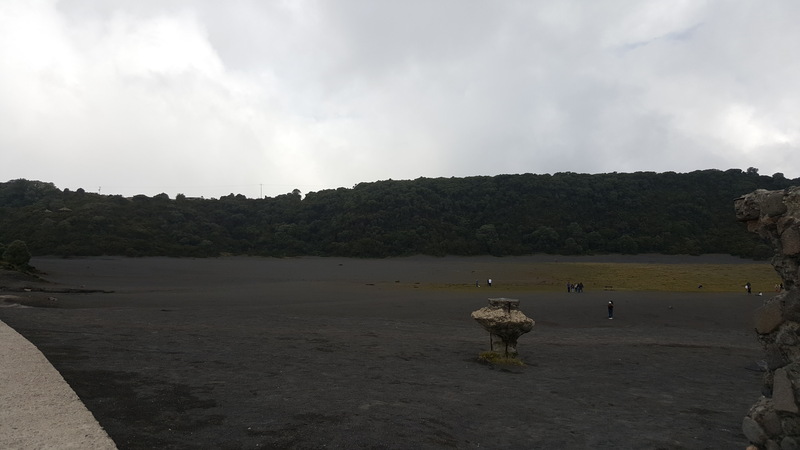 Irazu is less active than Turrialba, and has completely dormant craters that we could walk through. 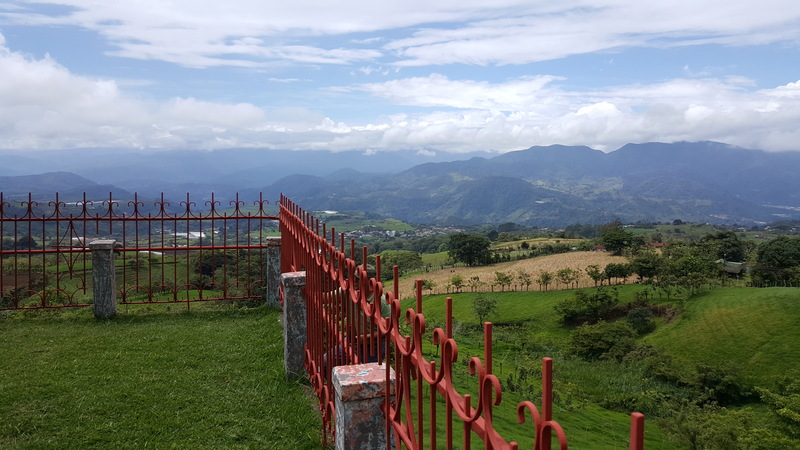 Our ride started at seventy-eight degrees, but ended at the top of Irazu at forty-six degrees. My whole body was quaking with cold and my hands were numb by the time we arrived. The crater was a massive circular depression of flat gray dust. It was so barren and colorless that my mind felt on the verge of rejecting it as a possible reality. I felt an instinctive discomfort like looking at an altered image that intends to fool the eye. This color, it doesn’t exist in nature. Not a trace of brown or red, the blank hole felt extra terrestrial. I was walking on the moon. Even here, small tufts of grass were creeping. They were very sparse, but inconspicuous. Life, even here on this early moon, was finding a way. Those are mostly clouds with a little bit of some. If I could have approached that edge, I could have seen a lake below in the center of the crater completely devoid of life. 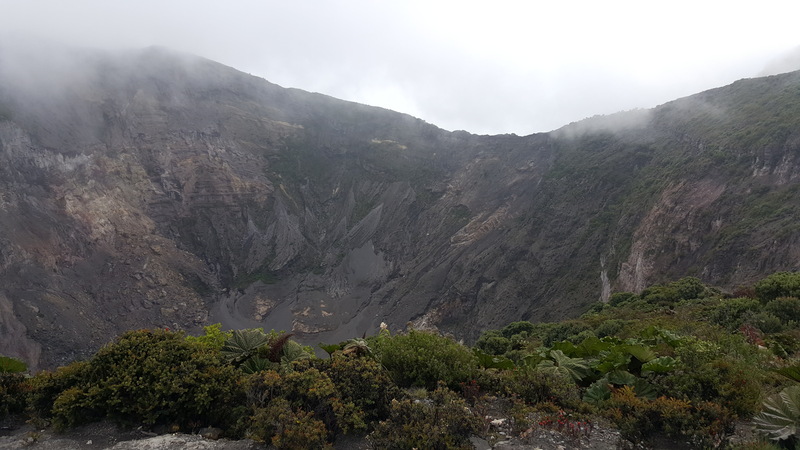 This is the active crater at Irazu. The rains found us on the ride back. The last thirty minutes of our ride was spent in one of the most severe rains I saw on my trip. Lightening streaked across the sky. In an unfortunate turn of events, a stalled car caused a 45 minute delay. The three lanes of the highway were choked with parked cars, moving only a few feet every several minutes. Our hands, now tired and aching from seven hours of riding, were losing feeling. We weaved between the lanes of traffic at a crawl carefully avoiding side mirrors, knowing that our time being physically capable of operating the motorcycles was fading. My belly clenched in fear. I was not afraid of the volcano or the remote mountain paths. But I was terrified of being inches away from cars in blinding rain. Once past the traffic jam, the highway opened and we went as fast as we dared. Although the speed limit was 80 kilometers per hour, we kept close to 60 knowing the water on the roads and on our break pads would make stopping short impossible. Even so the rain stung my lips and chin like pebbles, the speed making it feel less like a liquid and more like a solid. Water was washing over my legs and running into my shoes filling them faster than they could empty. When we pulled into her drive way and stripped off our dripping clothes, I felt my jaw loosen. I stretched my aching hands, my fingertips tingled with fresh sensation. That night I slept better than I had in days. That ride through the rain was the most dangerous thing I have ever done on a motorcycle. And I felt it. But I would do it again to ride up those volcanoes. My many thanks to Adriana for making it happen. Flourishing life does does not happen in spite of the volcano, but because of it. Life is stubborn in the face of death. Those trees, horses, cows, and even the people are in danger of the monster that so lavishly feeds them. Death and danger are always there, but we have seat belts and safety features that obscure it. That each day is not a promise but a gift is close for people living in the path of lava, and yet they are not afraid. If they can live to the fullest with out fear we all can. 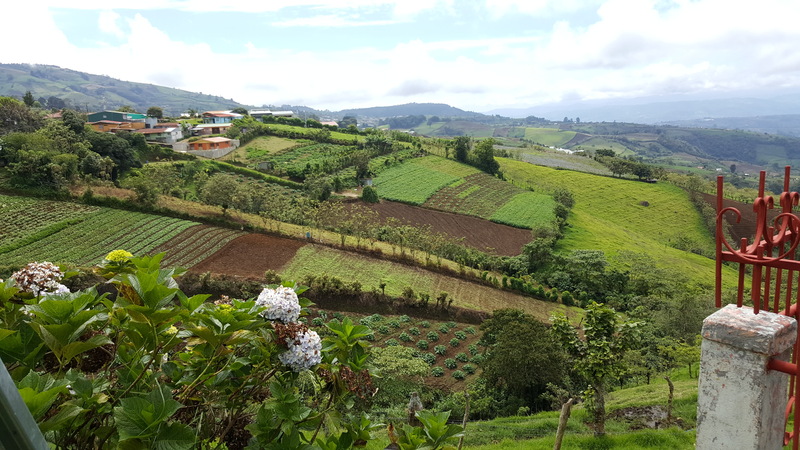 Categories: Uncategorized | Tags: costa rica, irazu, motorcycle riding, motorcycles, torrialba, train travel, volcanos | Permalink.